Kick start your morning (or your afternoon or evening!) 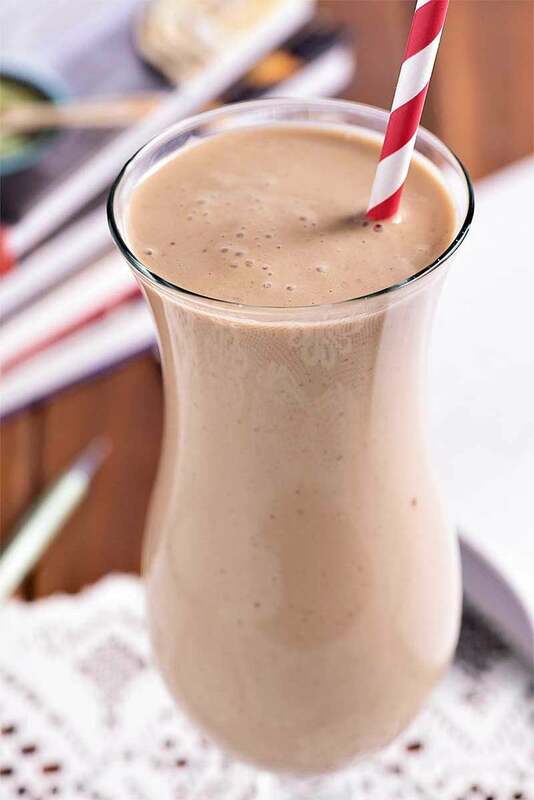 with this easy smoothie made with bananas, yogurt, and Folgers Instant Coffee. It's the perfect indulgence whenever you need a quick pick-me-up! I think most people fall into one of two categories: either you’re a morning person… or you’re not. But no matter which side of the fence you find yourself on, it’s always good to know (and be able to admit) just how you deal with the dawn of a new day. As for me, it just so happens that I’m a morning person – the jump-out-of-bed, get-ready-in-a-jiffy, motivated-to-conquer-the-world type of morning person – and when I started working from home, I thought this meant I was set. Because being my own boss? Starting work each day? That should be a breeze for someone who never needs to hit the snooze button on their alarm clock, right? It took me a while before I could admit that even I, she who is so sprightly in the morning that some days she even annoys herself, might actually need some structure in the early hours of the day. Because most mornings I found myself motivated to watch Netflix or play with the dogs for a few hours or read a book. All incredibly fun and satisfying things to do, for sure, but if I got my work done early enough then I’d have all afternoon for these types of things. What I really I needed was for my early hours to be productive. So, I decided to add a new fixture to my morning routine that would give me something to look forward to. And most importantly it had to be something I wasn’t allowed to enjoy until I was sitting in front of my computer, hands on the keys, ready to do all that world conquering. And this is where this delicious Breakfast Coffee Banana Smoothie comes in. Back when I had a “standard” office job, I wasn’t much of a coffee drinker. I might have poured a cup of coffee if everyone else was having coffee, but otherwise, I could take it or (most likely) leave it. However, that’s why it seemed like the perfect fit to my morning routine: to me, it was bright and shiny and new. And delicious. Can’t forget that. What I love most about this recipe is that it uses Folgers instant coffee, so there’s no need to brew a pot of coffee beforehand. And with the bananas and yogurt (or ice cream, if that’s more your thing) this smoothie also makes for a filling breakfast. Plus, how easy does this look? All you need is a blender, the ingredients (especially the Instant coffee!) and your mornings will be one step closer to being complete. Looking for more creative ways to use Instant coffee? 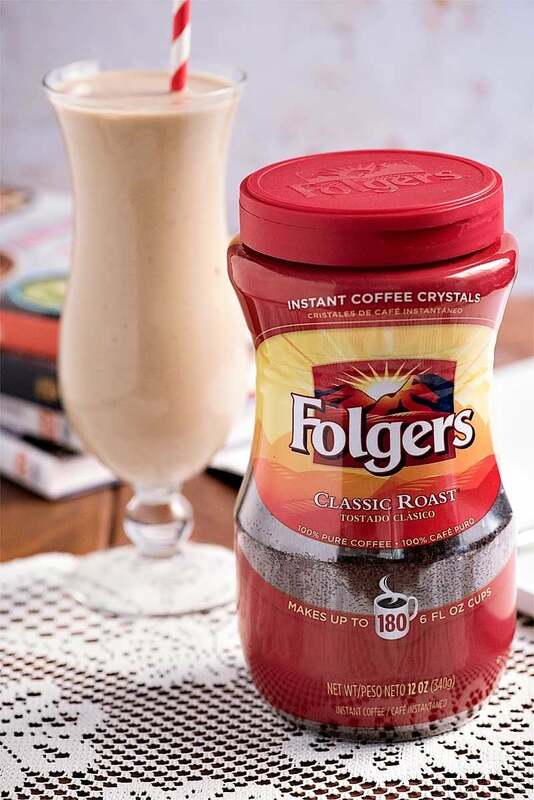 Check out Folgers Recipes for the ultimate inspiration to add a pick-me-up to your morning routine! You’ll need a trusty food processor for this breakfast smoothie recipe. I bought the Ninja Blender System almost 10 years ago and it hasn’t failed me yet! 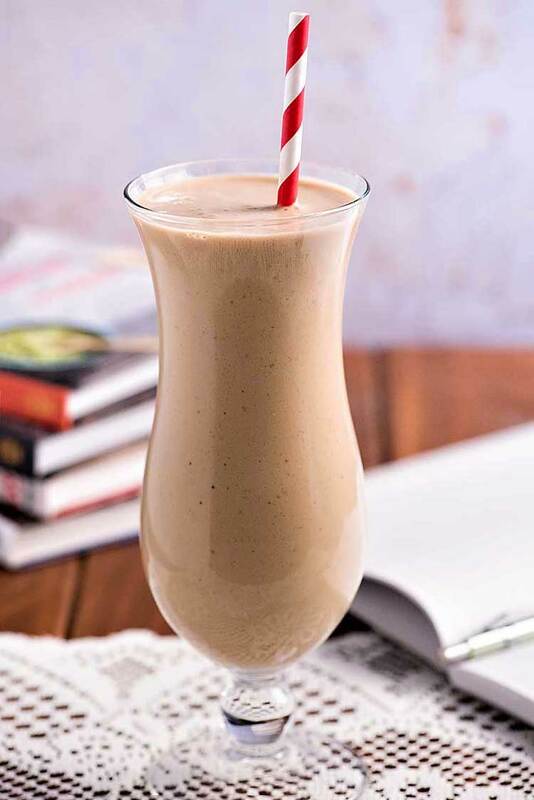 This recipe was designed to be used with instant coffee, as the grounds will dissolve in the smoothie. If you want to use traditional coffee, be sure to cold brew the coffee (or brew hot and let it cool). Depending on your tastes, you can use up to 1/3 cup of brewed coffee. And if you use brewed coffee, keep in mind that you will likely need to reduce the amount of milk used so that the consistency of the smoothie doesn’t become too watery. Looking for more sensible breakfast foods? Be sure to check out Breakfast Twice Baked Sweet Potatoes, Fried Cinnamon Banana Breakfast Bowls, Strawberry, Kiwi, and Granola Breakfast Popsicles, and Sweet Potato Hash with Fried Eggs. Like treats with coffee? There’s also Tiramisu Parfaits and Easy Tiramisu Dip. Add bananas, sugar, greek yogurt, milk, and Folgers instant coffee to a food processor. Blend mixture until smooth or until you can no longer see any of the Folgers Instant Coffee granules. Do a taste test, then add more sugar or Folgers Instant Coffee if desired. Pour smoothie into a tall glass and enjoy immediately. This smoothie looks like the perfect start to any day, so yummy! I love putting coffee in my morning smoothies! It sort of makes them dessert like. I totally agree Laren! 😀 Nothing better than starting off your day with a little indulgence. I want to start every single morning with this smoothie! 😀 Right?! Your morning boost and some healthy foods all in one shot! I made this today and love it! I was out of sugar (somehow) and used a dash of vanilla extract instead. It worked perfectly with plain greek yogurt! Okay. Alright. I had dinner like some two hours ago (it’s midnight here, India). And Was already feeling hungry (my eternal curse) that i checked the stuffs in the kitchen and Googled it. Relishing it. Though I used small yellow bananas, and it is awesome! could you use regular coffee? Hey Carol! You could substitute this for regular coffee, but the instant coffee will dissolve while the regular coffee grounds will not. It might be better to brew some coffee (let it cool) and use that instead. I haven’t tried this, but you could use about 1-2x brewed coffee (or to taste) in place of the instant coffee granules. 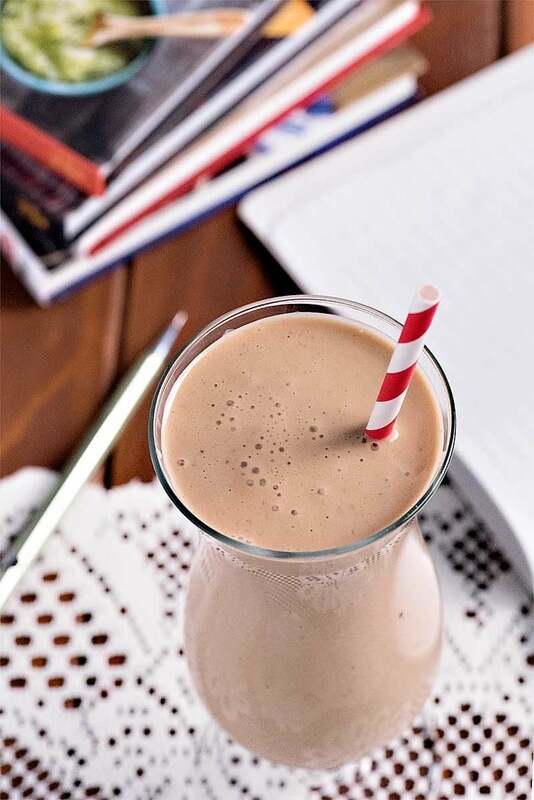 Hi Chrisy – just wondering if I could add a scoop of Protein Powder to this and would I need to add more milk? Hey Cindy! I haven’t experimented with adding protein powder, but depending on how much you add, I think the recipe should be fine without adding extra milk. 2 tbsp sugar?? Isn’t that an awful lot? Surely there must be a healthier alternative? Hey Erica! I tend to like a decent amount of sweetness to counter the yogurt, but feel free to adjust this (or use an alternative – honey or another natural sweetener?) to your tastes! Can it be any instant coffee, does it have to be Folgers instant coffee? Has anyone trying brewing the instant coffee after it’s cooled? How will this taste if I don’t have a food processor and just mix in a blender? ?